Roughly the same time last year--in June 2011--it was just 500,000 new units being activated daily. In 2010, a year or so earlier, it was more like 100,000 activations each day. On Wednesday, however, Google Executive Chairman Eric Schmidt announced at Motorola’s “On Display” event in New York that the platform has now reached a full 1.3 million new activations each day, according to a TechCrunch report, thus continuing steadily on its dramatic upward climb. There are now some 500 million Android devices out there in the wild around the globe, Schmidt said, and smartphones still outweigh tablets by far. In fact, just 70,000 of those 1.3 million daily activations are tablets, the report notes. As far as which Android flavors are in use, this week has afforded some new insight there as well, as indicated in the chart below. According to data published on the official Android developer forum earlier this week, in fact, Android 2.3 “Gingerbread” is still far and away the most widely used Android flavor, with a full 57.5 percent of the market, though it is declining. 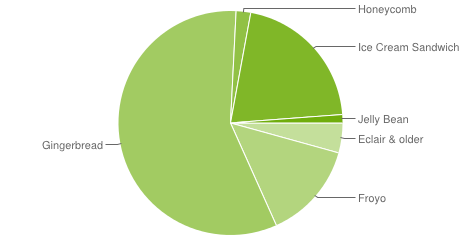 Coming in second is Android 4.0 “Ice Cream Sandwich,” with 20.9 percent of the market, followed by Android 2.2 “Froyo,” which currently holds 14 percent. The latest version--Android 4.1 “Jelly Bean”--is now on just 1.2 percent of devices, according to this data for the 14-day period ending Sept. 4 on Google Play. Now, with yesterday's launch of several new Motorola phones--not to mention the new Amazon Kindle Fire devices being introduced today, among many other recent Android announcements--it's going to be interesting to watch and see how these numbers change over the coming months.